… as too much knitting. Okay. I admit it. I am one of those crazy knitters who has far too many projects going at one time. Honestly, I do admire the self-discipline of knitters who work on one project from start to finish before starting the next project. But I will never be one of them. N-E-V-E-R! I also finished sleeve number 1 of my long-neglected Dale of Norway Gjende and even knit a couple of rounds of sleeve number 2, which is ¾s finished. I should feel as though I’m making progress. But I still haven’t touched Starmore’s Kinsale, or Janet Szabo’s Shawl Collar Aran sweater, not to mention a couple of pairs of socks that are languishing. Why? Why are all these WIP (Works in Progress) sitting untouched? Well, because I have started three, count ‘em, three new projects. One project is a pair of socks for a friend. It’s the good old Blueberry Waffle pattern which is mindless knitting I can do while reading e-mail and news reports on my computer. No big deal; I nearly always have a mindless knitting project by my computer. The third project is a simple lace scarf in the checkered acre pattern with garter stitch border. I’m using Jamieson’s Ultra lace weight, 50% lambswool and 50% Shetland wool, in natural white. I bought three balls of it from the wonderful Judy Alexander at theknitter.com a while back to try it out, and I thought a scarf would be a good project for it. Why did I start it now? 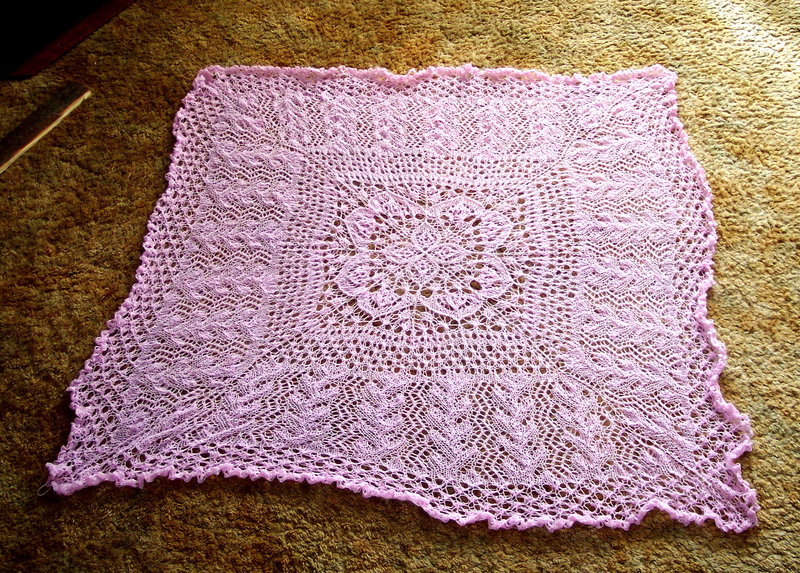 Well, I decided to make a lace scarf as a gift for one of Greg’s former coworkers who is retiring in October. Yes, there’s a bit of a time crunch and scarves take longer than one might think. But I’m making good progress on it and, of course, it is my priority project. I’ll get it finished in time, but maybe at the expense of the boy’s Aran. So far I like the Jamiesons Ultra just fine, but not quite as well as I like the Jameson & Smith Shetland Supreme. Yikes! Did I just mention J & S Shetland Supreme? That reminds me that my Orkney Pi is still sitting on the dining room chair sans border. I started the border weeks ago, but I didn’t get very far. I decided to use a border of my own “design.” I knitted a sample and was pleased with the results, so I went to work on the shawl. After a few false starts, I thought I was on the right track. But, lo and behold, the edging was cupping like crazy. Will it block flat? I worry. Should I knit a few more repeats and block it to see? I wonder. When in doubt, start a new project!